When planning your wedding, communication is key. Just as important as the messages you send are the media that you choose to send them. 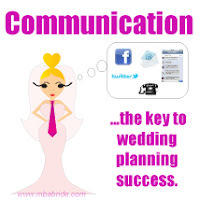 People respond differently to messages from different channels and it is crucial that the business-savvy bride be fully aware of her choices so she can be effective. Let’s take an example of my friend, Lexi. Lexi was trying to reach a vendor and was expressing concern about the vendor was not replying to her. Lexi explained how she sent her email after email with no response. I asked Lexi if she had called her on the phone, for which she looked at me bewildered. There is much more to communications than just sending your messages. Word choice, tone, body language, facial expressions, etc all contribute to the ultimate message and although many of our technological ways of communicating help to make us more efficient, it can also make us miss important gestures that communicate something else. It’s important that we understand the pros and cons of the channels, but that we also understand what others prefer. It requires a lot of effort to understand how people prefer to be communicated to. But once you get it, you’ll find that you are more productive in your wedding planning process. Let’s consider some of the big channels that people use to communicate and the implications of those channels. Face to face/Skype. This method is the most effective, but also the most resource intensive. Face to face interactions allow you to interpret words, tone, and body language. Phone. This method is the next most effective method for productivity, but requires time and attention. Phone calls allow you to send and receive urgent messages and allow for immediate confirmation that the user on the other side of the phone understands what you are saying. You’re able to interpret words and tone, but not body language. Email/facebook message/etc. This method of communication allows for full explanation of thoughts, ideas, and concepts. The most filter friendly communication choice, users are able to thoroughly think through what they want to express before they express it. The downside to using these channels is that the responses may not be immediate and body language can not be interpreted. Worst of all is that tone is often misinterpreted in this channel. Unless you’re a professional writer, don’t even try sarcasm – it never works. Chats/Text messages. Like an email or Facebook message, chat functionality allows you to type to someone usually incurring an immediate response. Confirmations are easy to affirm, but you are unable to interpret body language and tone may be misinterpreted. Facebook Wall/Tweet. Equivalent to walking out into the middle of the town square and hollering your message, communicating on a Facebook Wall or with a Tweet is a very public event. While it may be most effective (humiliating?) to get someone to action, personalized messages published in e-public spaces like this can be embarrassing, humbling, or even aggravating. Like the other digital vehicles, users are not able to interpret body language and tone may be misinterpreted in these spaces. When planning your wedding, it’s important that you understand how those around you prefer to be communicated with. Knowing which channel they respond the best in and what channel best supports your message is crucial to communication success in wedding planning. So, which method do you prefer the most? Which do you respond the best to?